Beach Lane Books, 9781534412774, 160pp. 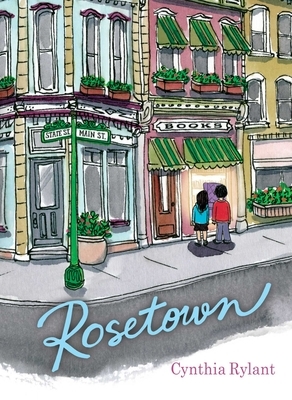 From Newbery Medalist Cynthia Rylant comes the charming story of nine-year-old Flora Smallwood and the eventful year she spends in the quiet community of Rosetown, Indiana. For nine-year-old Flora Smallwood, Rosetown, Indiana, is full of surprises, many of the best of which happen at the Wing and a Chair Used Book Shop, where she loves to read vintage children’s books after school in the faded purple chair by the window. But lately, those surprises haven’t been so good. Her dear old dog, Laurence, recently passed away. Not long after, her parents decided to take a breather from their marriage, and now Flora has to move back and forth between their two houses. Plus, she’s just begun fourth grade, and it is so much different than third. Luckily Flora has two wonderful friends—one old and one new. And with them around to share thoughts and laughs and adventures big and small, life in Rosetown still has many sweet moments—and even some very happy surprises! A sensitive and perceptive girl searches for balance and order in this taut, graceful novel from Rylant, set in small-town Indiana in 1972. Flora, “who sometimes felt quite acutely the stress of being nine years old,” is grappling with the death of her beloved dog and with her parents’ separation, and wonders where her fellow fourth-graders found their “sudden confidence.” A comforting constant in her off-kilter life is Wings and a Chair Used Books, where her mother works; Flora is happiest curled up in the store’s eponymous armchair, reading “extra-vintage” children’s books. She shares the bookshop, and the worlds and words its books contain, with Yury, a compassionate new classmate from Ukraine, who in turn “shared his cleverness” with Flora and makes her “feel more certain.” Serenity, the stray cat she adopts, brings another affirming change to Flora’s life, as does her parents’ reconciliation and their decision to purchase an 1890 letterpress and open a paper and printing shop. Eloquent and resonant, Rylant’s writing is as timeless as the deceptively simple story she relays, which celebrates objects and relationships both old and new, and poignantly underscores the significance of family, friendship, and home.